Originally an ironworker for the Atlas Fence Company in San Diego, Calif., off-road racing had been a hobby for Ivan “Ironman” Stewart since he was a kid driving go-karts. At 28, Stewart’s opportunity to take his off-road interest to the next level came when he was scheduled to co-drive the 1973 Ensenada 300 in a Class 2 buggy with his long-time friend Bill Hrynko. Prior to the race, Hrynko fell off a ladder and broke his leg. Unprecedented at the time, Stewart decided to drive the race solo. He won the race and continued racing solo and winning. Three years later, Stewart completed the infamous and arduous Baja 1000 solo in a single-seat vehicle. He won $500 and the first Valvoline Ironman Award. For Stewart, more Ironman Awards followed, along with his nickname. In 1983, Stewart joined Toyota’s factory-sponsored effort with the Precision Preparation Inc. (PPI) race team. This was the beginning of one of the longest-standing and most successful driver/manufacturer relationships on record. Today, Stewart and Toyota have teamed up for more than 30 years resulting in unparalleled success in stadium and desert racing. Stewart played an important role in Toyota’s dominance during the 12-year history of the Mickey Thompson Entertainment Group (MTEG) stadium series. Along with three driver’s championships, Stewart holds the record for all-time MTEG wins with 17. 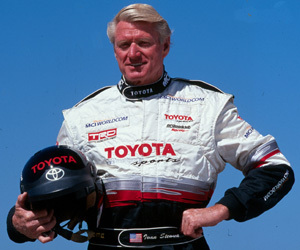 In 1984, Toyota and PPI expanded their racing efforts to compete in the desert. Within the first two years, Stewart drove to six class victories, including two SCORE World Championships. Stewart then became the only single-entry driver when Toyota and PPI moved to Class 1 in 1985. The 1993 season was significant as Stewart sweep the “Crown Jewels” of desert racing – Mint 400, Baja 500 and Baja 1000 – in the same season. In addition, he clinched his second SCORE Overall and Unlimited Class series championships, matching his 1990 record as the only driver in the series’ history to earn both titles in the same year. Stewart’s popularity with in the Mickey Thompson Entertainment Group (MTEG) stadium series led to a sponsorship and development agreement for the “Ivan ‘Ironman’ Stewart Super Off-Road” arcade games. With three steering wheels, players compete against each other or the computer in racing around several top-view indoor off-road truck tracks of increasing difficulty. It was one of the first games where the player could upgrade his or her vehicle by earning points or money, a system that is used in many racing games today. The game was ranked the 35th best game of all time by Amiga Power, and led to a number of home gaming versions. Stewart’s driving talent is impeccable, but he will be the first to mention that it is the support of his friends and family that helps get him to the winner’s circle. In addition, he plays an active role in the community, and is focused on promoting goal setting. Stewart enjoys all types of racing. He competed as a professional in the 1984 and 1997 Toyota Pro/Celebrity Race in Long Beach, Calif. He also raced in the 1997 Pikes Peak International Hill Climb “Challenge of Champions” race along with Roger Mears and Parnelli Jones. Stewart continues working with Toyota and TRD promoting racing and products, and mentoring the next generation of drivers. He is married to his wife of 51 years, Linda Stewart. They have three adult children, Brian, Gary and Craig and five grandchildren.